Rewind of last year. Get your hopes up than crash n burn. Thats with Cutler and not Hanie. O-Line, O-Line! Come out, come out, where ever you are! Shoutouts to Delphi on the sig! Washington and the NY Giants are 8-6 and if they win out we are all 10-6. The Redskins would win the NFC East. The Giants would be ties with us and it would come down to conference record. All the realistic scenarios listed are a Giants loss and Redskins losing a game. We are currently in 8th place if everyone wins out we stay in 8th place. If Washington wins out they win the NFC East. If the Giants win out (10-6) they get the wildcard because they have 4 NFC losses and we have 5. We also need the Vikings to lose a game because they have the tie breaker against us. Yes. The Vikings have the Packers and Texans so they are done. We need to win out and for the Giants to lose this week in Baltimore. Now if we lose we are screwed because then we need everyone mentioned to lose and we bring the Cowboys back into the picture if they win. Who is reporting we are in 8th? Everything I have seen says we're in 7th, behind SEA and MIN in the WC chase. I don't see how the Giants can all of a sudden jump us if we win our last two, both of which are NFC games. Thats from playing w/ the playoff machine for a while. Lets say we do win out and finish 10-6, does Lovie keep his job? Or would it depend on how far we go in the playoffs? And we have seen 5 and 6 seeds make, even win the Super bowl, so if(and thats a big if) we somehow make it, anythings possible. So we need to win out and get some help with other NFC losses. Because there conference record is better than ours if the win out. They have 4 losses in the NFC and we have 5. We need then to lose one of their upcoming games so that they are 9-7 because they hold the tie breaker. If both the Giants and Vikings lose either of their last 2 games the Bears are in, doesn't matter whether its NFC or AFC. If the Giants win the division and Minnesota loses we're in. That's the short version. 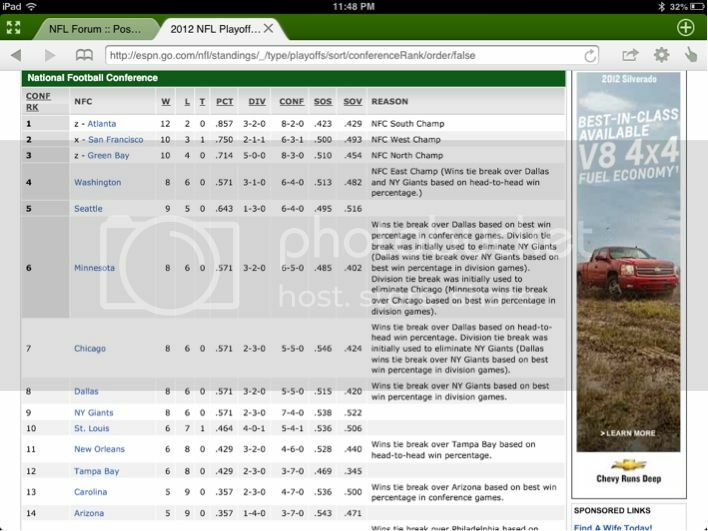 If the Giants win out but lose the division they hold the wildcard tiebreaker over us. Of course that is only taking those teams into account. The Seahawks have 2 tough games to finish out the year as well hosting the 9ers and Rams. If Bears, Giants, Seahawks, Redskins/Cowboys all finish 10-6 the Bears and Giants by virtue of conference record get in as the wildcards. It's more likely than unlikely at this point that the Bears make the playoffs at 10-6. Don't the Seahawks get in at 10-6 because they beat us? Nope, if everybody has a 10-6 record head to head cant be used. It's weird but its the way it is according to the playoff machine.